HCISD » Lee Means Fine Arts Academy presents Disney’s The Little Mermaid Jr.
Lee Means Fine Arts Academy presents Disney’s The Little Mermaid Jr.
Lee Means Elementary Fine Arts Academy presents Disney’s The Little Mermaid Jr. Performances will take place at HCISD’s Performing Arts Center located at 3217 Wilson Rd. in Harlingen. 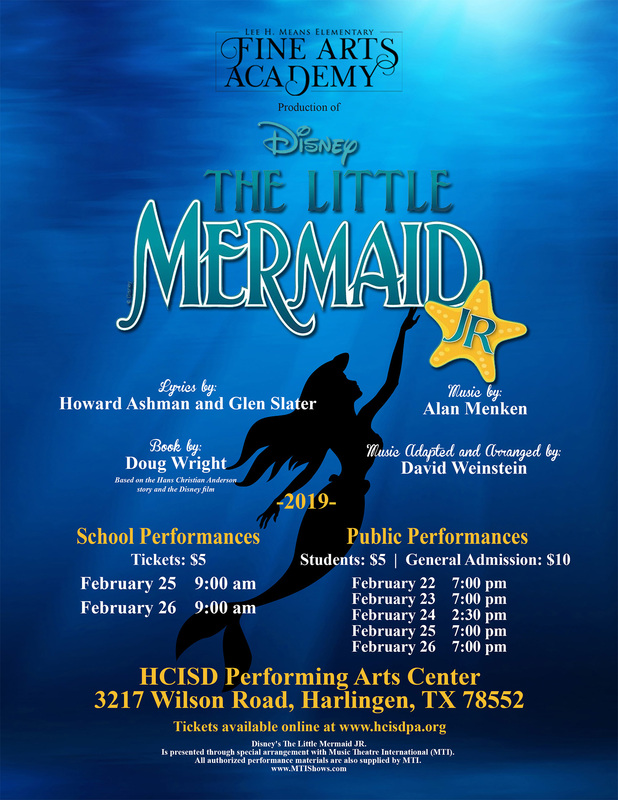 Get your tickets online at www.hcisdpa.org. February 25 at 9 a.m.
February 26 at 9 a.m.
February 22 at 7 p.m.
February 23 at 7 p.m.
February 24 at 2:30 p.m.
February 25 at 7 p.m.
February 27 at 7 p.m.